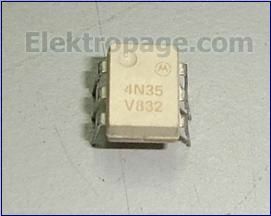 In an optocoupler the emitter and the sensor are placed in the same package, provides an output current proportional to input current, with a high degree of isolation. 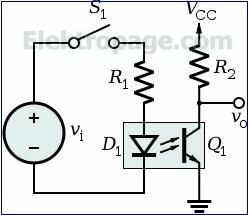 Typical isolation resistance between emitter and detector is 1011 ohms with isolation voltages upto 2500 V.
Output current in phototransistor-coupled pairs is typically 35% of the LED input current with a linear relation between the two. The symbol of the optocoupler when emitter is LED and detector is phototransistor is shown in fig. 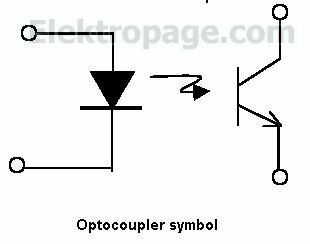 The optocoupler is most commonly used to couple one circuit to another providing a high level of isolation. An optocoupler, also called opto-isolator. The silicon chip could be in the form of a photo diode, photo transistor, photo Darlington, or photo SCR.